Construction crews reached a milestone on Phase I of the Franklin County Jail construction project, as a topping out ceremony was held on Nov. 26. In front of representatives from Franklin County, the Franklin County Sherriff’s office, general contractors, subcontractors, members of the Columbus/Central Ohio Building Trades and other invited guests, celebrated as the final piece of steel structure for the 429,000 square-foot jail was put into place. An artist’s rendering of the new Franklin County Jail, which is currently under construction. Dorsey Hager, Secretary-Treasurer of the Columbus/Central Ohio Building and Construction Trades Council, said it was critical to get the facility’s skeleton up. Keeping the project on schedule has been tough, but members of the Columbus/Central Ohio Building Trades have succeeded, despite early cold weather and rain. The new $175 million building is part of a two-phase process to combine two jails in Columbus into one facility. 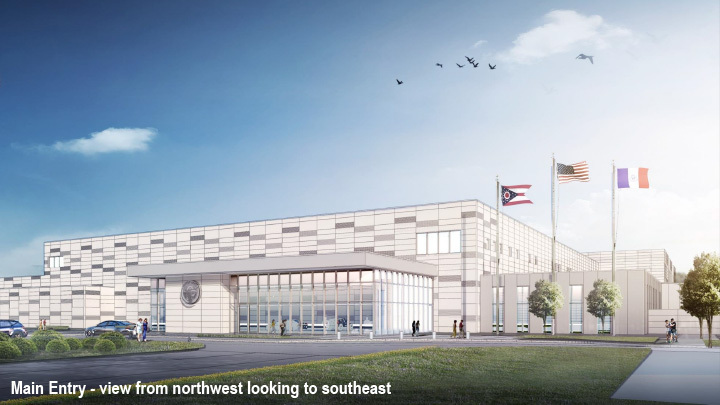 Phase I will create over 200 jobs for members affiliated with the Columbus/Central Ohio Building and Construction Trades and is being built under a Memorandum of Understanding with Franklin County. The MOU is similar to a Project Labor Agreement, but includes workforce goals such as diversification and local hiring. 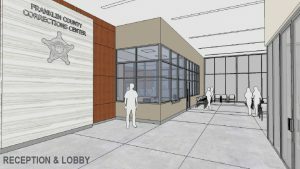 A rendering of the new Franklin County Jail lobby. Phase I will allow the county to close the current downtown jail facility, which first opened in 1969, and Phase II construction will eventually lead to the closure of the other current Franklin County jail facility on Jackson Pike. 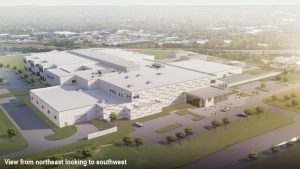 The new 23-acre facility will initially house a minimum of 850 beds and include a central utility plant and infrastructure to accommodate up to 2,800 beds, which will include special housing for inmates with mental health or behavior problems, a medical clinic and a 300-person orientation unit. Gilbane Building Company and joint venture partner Smoot Construction are providing construction management agency services for the project, with Phase I slated for completion in spring 2021. Work on the $160 million Phase II of the jail is expected to begin in early 2020. The Managers and Agents of the Local Unions meet to conduct business of the council. This meeting takes place in the IBEW 683 Union Hall. Jonathan Wentz from the Workers Center and Jessica Vernon from the Ohio AFL-CIO will be our guests. The Officers meet to discuss the business of the Council and review the finances. This meeting takes place in Room 202 / the Columbus Building Trades Executive Board Room. The Delegates meet to discuss the business of the Council. This meeting takes place in the IBEW 683 Union Hall. © 2017 Columbus Building & Construction Trades Council. All Rights Reserved.